NOJA Power has won a multimillion dollar contract to supply one of Australia's leading power distributors equipment to improve network reliability. 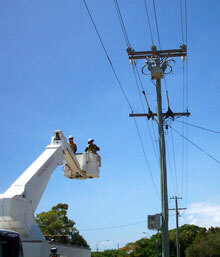 The highly competitive international tender was awarded to NOJA Power to supply pole-mounted reclosers to assist ENERGEX enhance network reliability as part of their five year, $4 billion plus network upgrade program. A top 100 Australian company, ENERGEX is aiming to improve its rural reliability with the installation of the NOJA Power automatic circuit reclosers on the 11KV network to limit the number of customers interrupted during faults. ENERGEX is one of Australia's largest and fastest-growing corporations with more than 3900 staff working in a range of roles to supply electricity to a population of around 2.8 million people in South East Queensland. In the 2008-09 financial year ENERGEX is investing around $830 million on upgrades to its electricity network while a further $340 million-plus has been set aside to maintain and operate the network. That's an overall average of more than $3 million a day. Under the Queensland Electricity Industry Code, ENERGEX is required to use its best endeavours to ensure that it does not exceed minimum service standards for urban and short rural SAIDI and SAIFI. In order to minimise the possibility of exceeding these targets, ENERGEX is focusing on improving the performance of its rural network over the next five years. As the majority of unreliability arises from faults on the 11 kV network, one of ENERGEX's strategies to improve its rural network performance is the installation of automatic circuit reclosers and sectionalisers on the 11 kV network to limit the number of customers interrupted during faults. ENERGEX currently has approximately 540 automatic circuit reclosers and sectionalisers installed on its network (in a normally closed state). The majority of these devices are installed on rural feeders. ENERGEX has 335 rural feeders supplying more than 340,000 customers with a total installed circuit exposure of almost 14,000 km. Of these feeders, around 224 have at least one ACR or sectionaliser installed. For the 2007/08 financial year, there were 744 faults on the rural 11 kV network which involved a protection operation. Approximately 50% of these faults occurred beyond a recloser or sectionaliser. ENERGEX's reported rural SAIDI due to unplanned outages in 2007/08 was 205 minutes. ENERGEX estimates that in 2007/08 its installed reclosers and sectionalisers saved 91 minutes of rural SAIDI, or 31%. As a result of these ongoing performance benefits, ENERGEX is continuing to install automatic circuit reclosers and sectionalisers on its 11 kV network as part of an overall reliability improvement program, with significant numbers of ACRs and sectionalisers proposed to be installed in coming years. The majority of these new devices will be installed on rural 11 kV feeders. ENERGEX is also proposing to undertake programs to improve the reliability of its urban 11 kV network. One of the strategies to achieve this is the accelerated deployment of Distribution System SCADA (DSS) being undertaken as part of current and future reliability programs of work. DSS includes application of remotely controlled load break switches (non-fault break) to increase the speed of restoration to customers following a fault. Over the next 5-7 years, the total number of remotely controlled switching devices is expected to exceed 3000 sites. In 2003, ENERGEX commenced using the NOJA Power OSM Recloser product. ENERGEX have traditionally utilised reclosers in their rural area, however a trial in 2004 saw 120 NOJA Power OSM Reclosers installed predominantly on its urban network with a view to increase reliability and remote control. While the program represented a relatively small number of feeders, the results have been a significant increase in reliability on the feeders where these devices were installed since completion of the program in January 2004. In fact, for the period up to end of 2006, the total estimated urban SAIDI was 11.4 minutes. This represents a huge success for both the reliability of the network where the devices were installed, and for the NOJA Power OSM Recloser. As part of the ENERGEX five-year network upgrade program, NOJA Power has been contracted to supply the pole mounted recloser requirements which will predominantly be installed throughout the rural ENERGEX network to increase integrity and reliability of the distribution network. The new reclosers will all be remotely controlled via DNP3 communications protocol together with a spread spectrum frequency hopping radio system to integrate into the DSS. The contract was awarded after a competitive international tender was called followed by a detailed technical and commercial evaluation and audit process.